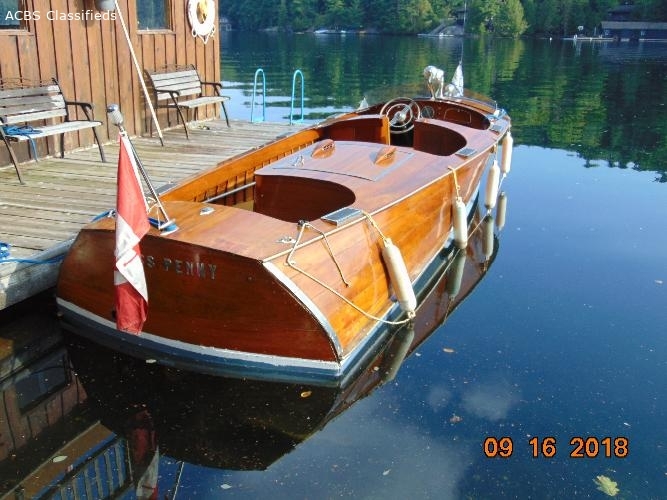 Miss Penney built by Duke Boats of Port Carling Ontario in 1950 as a one off design, with a walk through past the engine, and a removable section of the front seat allowing passage from the bow to the stern she also has built in storage lockers between the front and middle seat. The vessel was purchased in Dalston, Ontario in 1987. The boat was stored in an unheated garage with a dirt floor. The interior dead wood engine stringers and floor support structure where of western spruce and completely rotten, these where replaced with white oak. The vessel was refurbished during 1988 - 1990. The old varnish was sanded off inside and out and 8 coats of varnish applied. The dead wood was replaced with white oak and new floor of pressure treated plywood installed. The six cylinder Grey Marine engine was rebuilt by Pall Engines of Orillia, Ontario and converted to a 12 volt system. The rudder was replaced with a bronze rudder, the shaft was replaced as was the skeg and bronze propeller. A new gas tank was installed and a new copper gas line was run to the engine. The refurbished vessel was launched in Stills Bay, Lake Joseph in 1990 where it has been housed in a boat house to present day.